Keeping me on the straight and narrow! 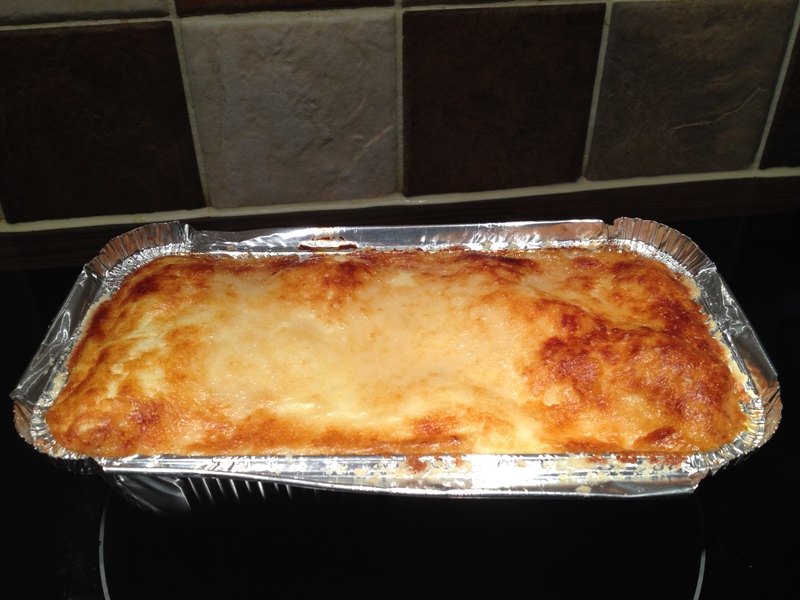 So, I decided to put up the recipe for the lasagne I made for group last Monday, since I’m making a batch of it today. It would be entirely syn free if not for the parmesan on top (which can be used as a healthy extra) and the bolognese mix (which could be swapped out for mixed herbs – Waitrose do an amazing one in their cooks range here). See the end of the post for a list of ingredients you’ll need. Before you start, preheat the oven to approximately Gas Mark 6. 1) Fry off the onions (if including them – you won’t ever see an onion on this blog since I can’t stand them) and garlic (if you’re not including onions, add the garlic with the mince because otherwise it’ll burn and be really bitter and yucky) in some Fry Light. 2) Add the mince and fry until brown. Drain any excess fat. 3) Add chopped tomatoes. Fill the can with water and add that to the pan. 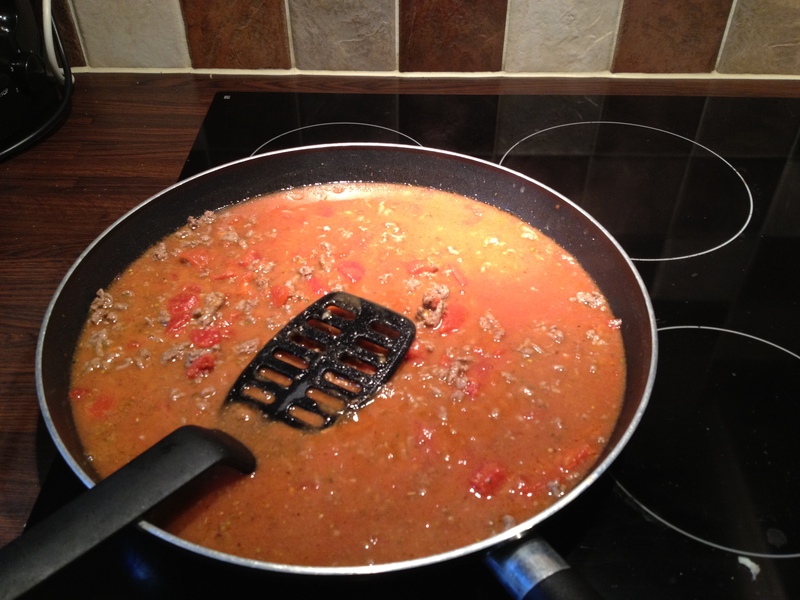 4) Mix in herbs/bolognese mix and stir until well blended. 5) Simmer until the sauce has thickened to a consistency you’re happy with and then remove from the heat. Variations: Could add veg (Slimming World usually recommends carrots and celery) or mushrooms; use meat substitute (eg Quorn) to make it vegetarian; could add bacon/pancetta for extra flavour (which should be added with the onions/before the mince). Once the bolognese sauce is cooked (or simmering, if you can keep an eye on it at the same time!) start making the white sauce. 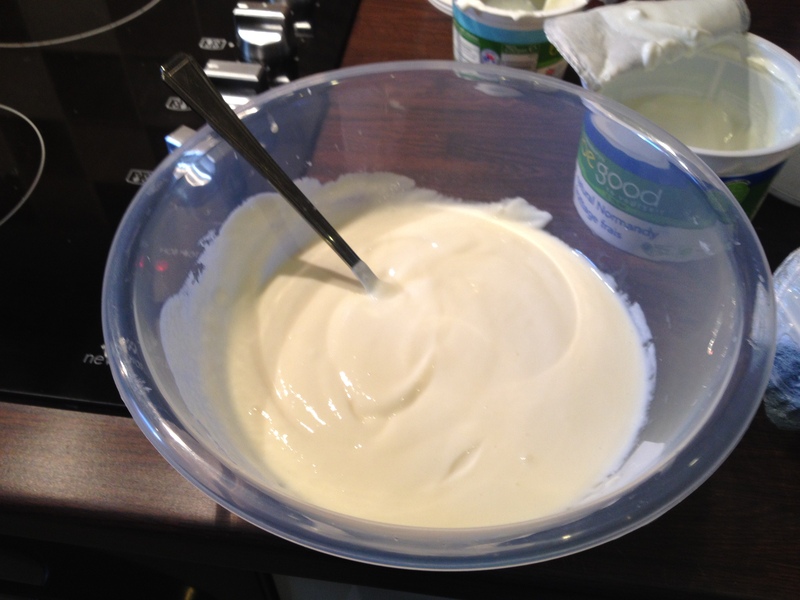 1) Place the quark into a large mixing bowl and beat until relatively smooth. 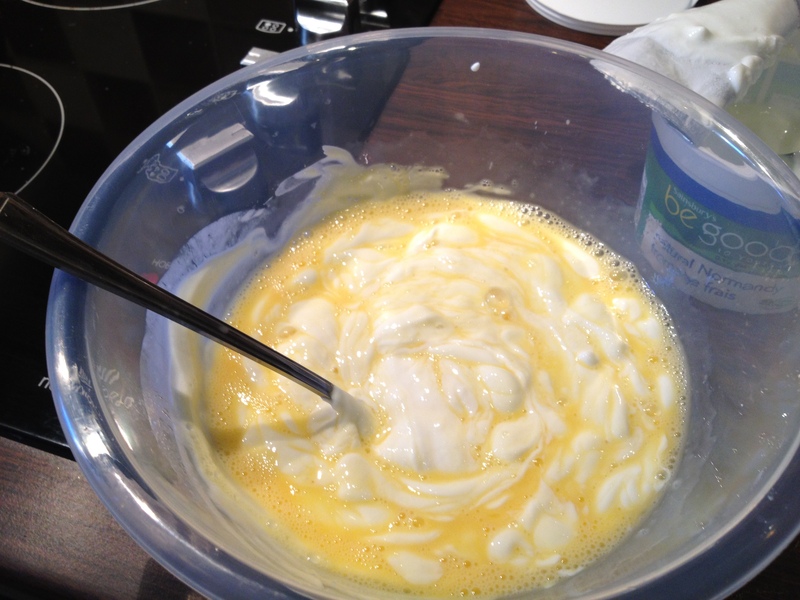 2) Add the fromage frais to the quark and mix well. 3) In a separate dish, beat two eggs. 4) Add the eggs to the cheesy mix and stir well. 5) Add a pinch or two of nutmeg to the whole thing and mix. As you can see, this is the super simplest cheese sauce you’re ever going to make! The amounts above are suggested only; this is one sauce where you can stick it all in and, as long as the ratios are pretty much the same (though you never really need to double or half herbs/spices even if you’re doubling or halfing a recipe) it’ll all be good! So then, you just need to put it all together in lasagne form. If you cooked the bolognese and took it off the heat before you started the cheese sauce, you’ll just need to give it a good stir. 1) Take an oven-proof dish and place a layer of the meat sauce. 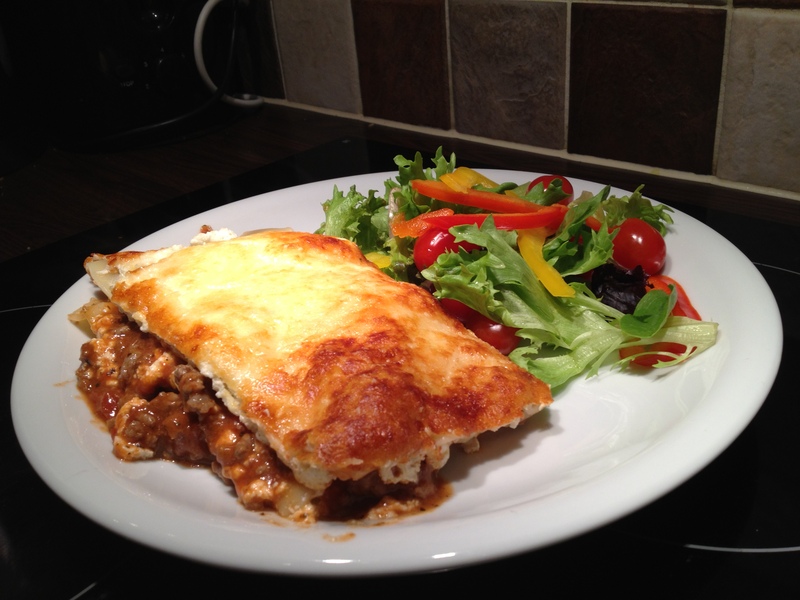 2) Cover with lasagne sheets (you could double layer them for a more substantial carbs hit – though be aware that, as ever, fresh pasta is not free on Slimming World). 4) Pour/smooth another layer of the bolognese sauce on top of that and cover with lasagne sheets. 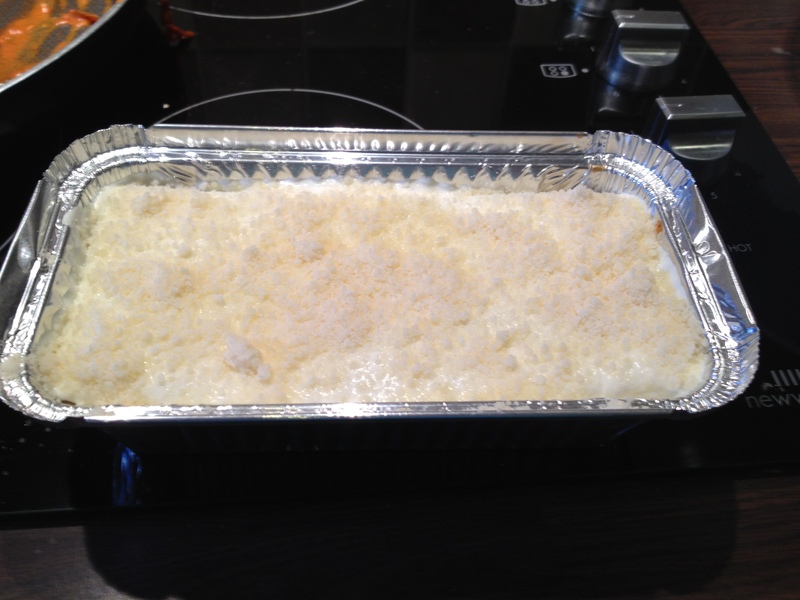 5) Top with grated parmesan (weigh it for absolute certainty). 6) Bake in the oven at about Gas Mark 6 for 40 minutes (adjusting according to the size, ie if it’s huge it might take longer but if it’s individual size it might take more like 30 minutes). And voila, Slimming World (nearly) Sin Free Lasagne! I think it’s worth the effort to make this, since this is actually my favourite lasagne in the world – I’m too fussy to properly enjoy other people’s lasagne since they invariably include copious amounts of onions and/or mushrooms. One exception to this (so far) is an Italian girl I was on study abroad with who made the most glorious lasagne I’ve ever tasted! Otherwise, my mum loves Marks & Spencers Count on Us Lasagne which is almost certainly cheaper (and definitely easier) than making your own. It’s a sad fact that making something like a lasagne from scratch is always going to be more expensive just from the sheer number of different ingredients involved – it will be cheaper if you use an Italian herb mix and keep in mind that once you have ingredients such as lasagne sheets and nutmeg, it would be cheaper to make. Credit: I’m not sure where the recipe came from. The bolognese sauce is pretty much just what I do whenever I want pasta bolognese. The cheese sauce was a slimming world recipes from one of the mags, I believe. I’ve used this recipe a few times now & love how easy it is to make – thank you !